There are a variety of uses for Hydrogen. It is the lightest element and can be used as a lifting agent in balloons. Since Hydrogen gas is highly flammable, it can be dangerous to use. But this property and others make Hydrogen suitable for use as a fuel. The most common use of Hydrogen is in chemical processes and reactions. How is hydrogen used as a lifting agent? How is hydrogen used as a fuel? What chemical processes use hydrogen? Hydrogen can cause a balloon to lift or float upward in air. Air consists of about 78% Nitrogen and 21% Oxygen. A Nitrogen atom has an atomic weight or mass of 14, Oxygen has an atomic mass of 16 and the atomic mass of Hydrogen is 1. All three are molecules in their natural state: N2, O2, and H2. Thus, a balloon filled with Hydrogen gas, weighs much less than the air it displaces. This creates a buoyancy force that pushes the balloon upward. A balloon filled with hydrogen gas (H2) will readily float upward in air. It seems to be a prime candidate for a lighter-than-air airship, but it also proved to be too dangerous. In the 1930s, Germany built a number of large lighter-than-air airships they called zeppelins. They are also called dirigibles and have a metal frame. The blimps we see in the sky today do not have a rigid structure that holds the airbag in shape. The Germans used the zeppelins to transport people and cargo across Europe. Their largest luxury zeppelin, the Hindenburg, had crossed the Atlantic Ocean 17 times, when in 1937 it landed in Manchester, New Jersey in front of a large crowd of onlookers and news reporters. 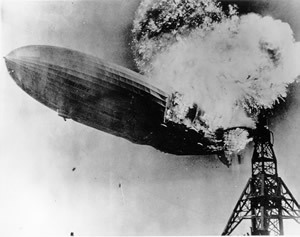 Suddenly, an electrical spark ignited the hydrogen inside the zeppelin, causing it to burst into flames. Many of the passengers were killed. After that accident, blimps would use helium gas. Although it was twice as heavy as hydrogen gas, it does not burn and is thus much safer to use. Today, weather balloons still use hydrogen gas. They are relatively small and pose no risk to people. Hydrogen can be used as a fuel. Since hydrogen is highly flammable, especially when mixed with pure oxygen, it is used as a fuel in rockets. Usually, they combine liquid hydrogen with liquid oxygen to make an explosive mixture. Unfortunately, in 1986, the U.S. Space Shuttle Challenger exploded when a flame accidentally ignited the liquid hydrogen in an external fuel tank. This again showed that the gas can be dangerous and cause a disaster in some situations. But also, hydrogen is one of the cleanest fuels because when it burns, the result is simple water. That is why there are efforts to create engines that can power automobiles on hydrogen. This would greatly help to reduce the air pollution and global warming problems. Although hydrogen is highly flammable, so also is gasoline. Although care must be taken, the amount of hydrogen used in an automobile would present no more of a hazard than the amount of gasoline used. One problem with using hydrogen to directly power an automobile is that it is very expensive to create pure hydrogen for this use. Also, the most common method to create hydrogen for use in cars is with methane (CH4) gas. Although burning the hydrogen is pollution-free, methane is a major contributor to the greenhouse effect of global warming. When hydrogen is heated to extreme temperatures, such as on the Sun, the nuclei of hydrogen atoms will fuse to create helium nuclei. This fusion results in the release of an enormous amount of energy, called thermonuclear energy. This process is what creates the energy of the sun. By using an Atomic Bomb to create a temperature similar to that on the Sun, thermonuclear fusion was created on the Earth in the form of a Hydrogen Bomb. This bomb was many times more powerful than an Atomic Bomb. Scientists are working on harnessing this energy to be used for peaceful means of creating inexpensive energy, especially for generating electrical power. Unfortunately, they have not been able to do this in a usable manner. Hydrogen is an essential part of many chemical processes. Hydrogen gas is used in the processing of petroleum products to break down crude oil into fuel oil, gasoline and such. Hydrogen is important in creating ammonia (NH3) for use in making fertilizer. Hydrogen gas is used as a hydrogenating agent to for polyunsaturated fats, such as used in margarine. But it is also used in making unhealthy trans-fats that are often used in cookies and other goods. Hydrogen was once used in zeppelins and blimps, but it proved too dangerous. Since Hydrogen gas is highly flammable, it can be suitable for use as a fuel. The most common use of Hydrogen is in chemical processes and reactions.